As many of you know on February 25th my blog was featured in the NY Times Motherlode column. I assumed that given this is the season when students are hearing or waiting to hear from colleges about their acceptance my post about Merrick’s college wait would resonate with many. Our situation does not mirror everyone’s because while grieving the loss of son while away at college, I’m readying another to leave for school. It is a paradox that shifts the earth beneath me. I had no idea my piece would elicit such strong reactions. Comments ranged from empathy and understanding to pure disdain. At times I wondered if some of the readers read what I wrote before commenting. I was accused of being elitist because Jordan went to Amherst College. Jordan’s school is many things; elitist is not one of them. They welcome students of all backgrounds. There was also innuendo that because Jordan died in a car accident, drugs or alcohol was involved. Jordan died on a clear fall night at 9:30 pm. Fatigue was the culprit not anything else; even though why that matters to a grieving parent fails me at this time. I know I didn’t have to read the comments but I did and I’m glad. Mixed in with accusatory comments were many that understood the point of my writing. Losing a child upends your world. The family that is left behind learns how to navigate the world with sorrow and loss as a new thread woven into life. We keep going and continue to ready our children to be independent, gracious, honorable human beings. I think this mom’s letter reeks of status and privilege. Her kids are going to elite private schools like Amherst and she worries as he “readies himself to be on his own”. Puleeeeze. Places like Amherst bend over backwards to ensure students are happy and successful, providing everything from psychologists to academic advisors to climbing walls to vegan cafeteria options. We have moms in this country who are sending their sons into tough inner-city schools because it is all they can afford. We have moms in this country who are sending their sons into the marines and thus into Iraq or Afghanistan. I want to read their letters. 14 readers recommended his comment. His letter above all others made me feel the need to explain the death of a son or daughter. Recently a dear friend lost his adult sister to cancer. 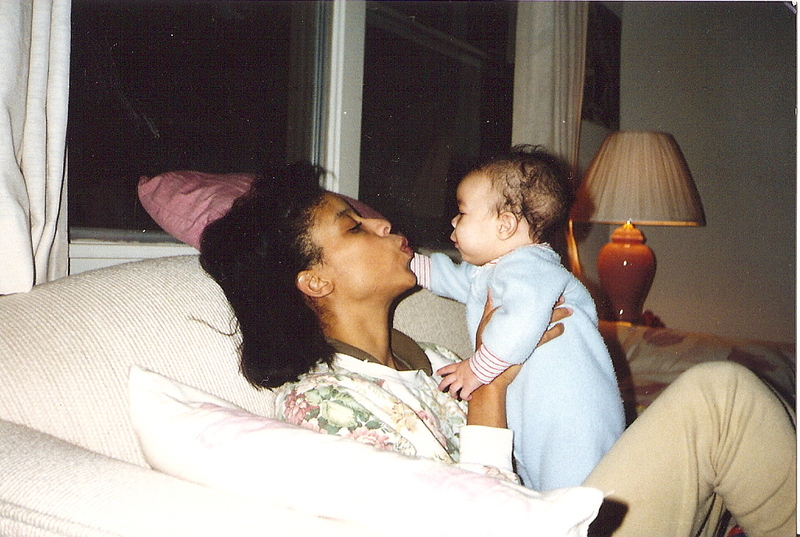 My first thought was of his mother and the heartache that cannot be wholly defined that I knew she was feeling. It was the same reaction I had while watching the Winter Olympics seeing the mother of the Georgian luger holding her head in her hands devastated by the news of her loss. It is the way I felt when Kelly Preston and John Travolta lost their son and the way I feel when I see or read about parents who’ve lost children in combat. We are all members of fraternity not of our choosing. Perhaps the letters of mothers of soldiers lost in combat might be more interesting to some readers. What I know is that no matter whether your child died while away at an elite institution, community college, war or coming home from a party, having police show up at your door at 1:30 in the morning and delivering news that is every parent’s worse fear is an equalizer. There is no hierarchy of trauma from grief. 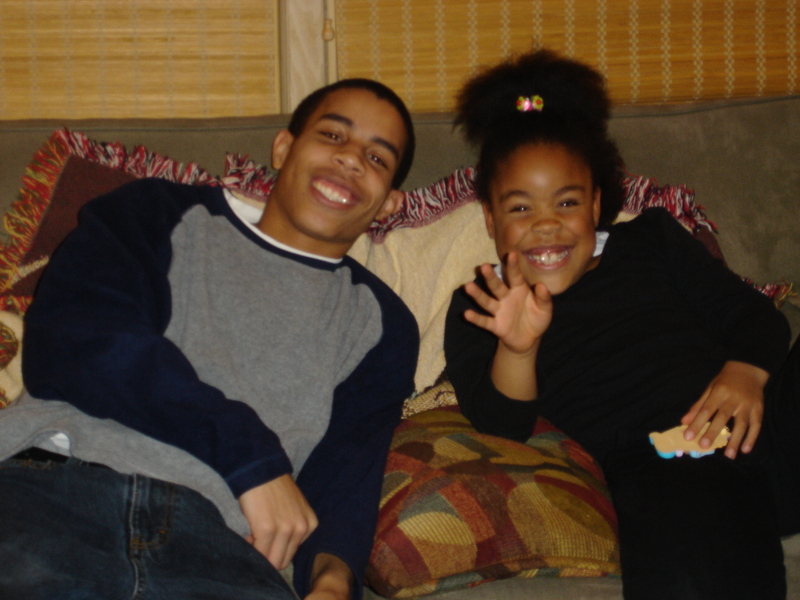 My husband and I have not hidden our grief from our children but we have been careful to not burden them with our grief either. They know we are here for them and we continue to nurture their spirits and interests wanting them to follow their dreams. A toll has been taken on my heart that may never fully repair. In spite of this fact, my commitment to be present for all of my children is fierce. I’m grateful for the support and understanding I receive from those who read my blog. I’ve been humbled by those who’ve written to me telling me how my words have helped ease some of their pain. I’ll keep writing. I hope you’ll keep reading. My latest post, “Letter To the College of My Son’s Choice,” is featured today in the NY Times Motherlode column. Thanks to Lisa Belkin for allowing my writing further reach. Does anyone remember those, “Baby on Board,” signs that were prevalent in the late ‘80’s and ‘90’s? They seemed to be suction cupped to the window of every other car on the road. I thought about those signs this morning and how I never got one after Jordan was born because it seemed to me that people should drive safely regardless of whether there was a baby in the car or not. We’re still waiting to see if the video camera we sent in for repair will come back to us with images of Jordan in the last months before he died. The repairman called again recently to say that they needed to repair the motherboard and wanted our approval because they couldn’t guarantee that our hard drive wouldn’t be lost. If the hard drive is lost in the process of repairing the machine we lose the footage that’s on the camera. When the repairman asked what I wanted to do, proceed, or not with the repairs, my response was silence, then a heavy sigh and then a plea. Another long silence as I try to keep the tears out of my voice. I realized how ridiculous it was that I’d poured my heart out to the repairman as though with my camera he’d be extra careful and more professional and with everyone else’s repairs he did slipshod work. That’s how I got to the baby on board signs in my meandering way. I would hope that the repairman always does his best work, just like when I saw the, “Baby on Board,” signs I hoped that everyone drove responsibly. Now I wish I’d wrapped the car Jordan was riding in on October 12th, 2008 in, “MY BABY ON BOARD,”signs and that doing so would have kept him alive. There are no magic formulas of protection or safety. I’m sitting with that harsh reality and waiting again for a box in the mail. Mark surprised me this weekend with dinner and a concert. He was able to keep the surprise from me although he did slip on the name of the restaurant. I teased him on the way to dinner telling him about my prowess as a detective. We had a great dinner where he gave me a lovely necklace with a typewriter letter, “J” as the charm. As I opened it he said to me, “I liked that it was a typewriter key, especially for you as a writer.” I nodded and told him, “I love that idea, but right now I’m glad the “J” stands for Jackie and Jordan as I clutched the charm. Mark nodded at me, already knowing I would love this fact about my gift. We went to the Anita Baker concert and sang along enjoying the show even though it started an hour late! Anita Baker ended the show with the song, “You Bring Me Joy.” I listened swaying in my seat with the line, “If I can’t see your face, I will remember your smile,” staying with me and traveling home with me. I loved spending such a special evening with Mark and the kids were so excited to see us going out having a good time. Lindsay and Kendall who knew about Mark’s surprise told him, “Daddy all my friends think you are so romantic.” I agree with Lindsay’s and Kendall’s friends. Mark is very romantic and my children are very loving. I know I’ll cherish the cards they’ll make and give to me tomorrow. Every year I pull out and look at the valentine given to me by Jordan when he was a teenager. 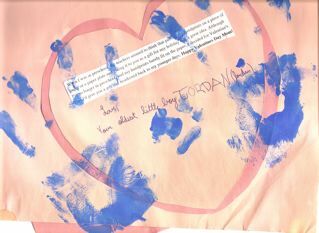 I will always cherish this homemade valentine given to me by Jordan when he was in high school. The card from him was such a surprise. I’m rerunning that post today as well. Valentine’s Day is reminding me that love endures and I’m so grateful that it does. The boxes with the programs were emptied today. They have been under the bench in the entry since October when the programs were printed for your Memorial service. I glimpse at the boxes everyday when I walk past, always planning to move them or get rid of them. Until today something always stopped me, I didn’t feel ready. She didn’t understand why I insisted on getting the boxes. I told her the boxes held extra programs from the Memorial Service. I explained that we didn’t use them because the front picture was too dark. For me, she already had. spoken word and dance and song. A few days ago I posted a query on Facebook asking, “What was your most memorable Valentine’s Day?” I kicked off the discussion by relaying the memory of a Valentine’s Day from my grad school days when my roommates and I went to a Bingo Hall with the mother of one of my roommates. It turned out to be an evening filled with laughter, girl talk and the hopes of winning the jackpot (not to be). When I was in preschool, teachers seemed to think that putting handprints on a piece of paper or a paper plate and using it as a gift for any holiday was a great idea. Although I’m no longer in preschool and my handprints barely fit on the paper, I decided for Valentine’s Day I’d give you a gift that hearkened(sp) back to my younger days. Happy Valentine’s Day Mom! Jordan then signed the card, “Love, Your oldest little boy, JORDAN” with the J backwards in the same way he used to write his name as a kindergartner. All the places I thought I’d stored the card turned up empty. I finally decided that the best way to find it was to stop worrying over and looking for it. If and when it was meant to be found, I would find it. Tonight as I polished the writing piece above, I searched for one of the programs from Jordan’s memorial service. I reached into the top drawer of our file cabinet and there on the side of the hanging files amongst other papers, was the card from Jordan. I’m sure I’ve checked this spot before but clearly not well enough. Tonight I pulled it out of the drawer, sat and looked at it, held my hand against Jordan’s handprint and cried. I found it just when I needed to find it. 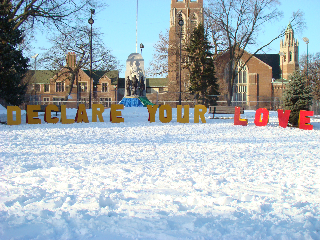 Now my most memorable Valentine’s Day, albeit a little early is the Valentine’s Day of 2010. Today when I went to pick the mail up off the floor from underneath the drop slot, I saw a pouch with paw protectors. I smiled remembering that Lindsay and Kendall told me to expect them as one of our fellow neighbors /dog walkers, was going to leave them for Nessie. Apparently they were too small for her dog. She eyed the rubber booties Nessie wore and thought we might like the canvas rubber soled type better. Before owning our dog I didn’t even know some dogs wore booties. Our small pawed, cold hating dog wears them out of necessity. When I saw the pouch lying with the mail it reminded me of how kind and good hearted the people of my community are. Her random act of kindness reminded me of all I have to be thankful for because of the people in my community. Today, even though its 9 degrees and the wind is blowing, the sky is blue and the sun warms my seat on the couch by the window. 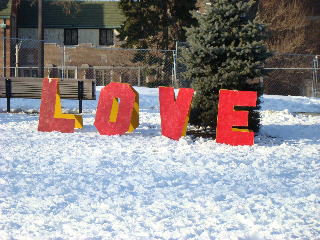 It feels like a good day to express gratitude and to give a valentine to the village I love. From the moment we moved in, Mark and I loved our new community. We felt after several job transfers, we’d found the place we wanted to stay. We chose this community over 16 years ago because we wanted a home and a neighborhood that would be the secure base from which our children would learn and make lasting ties. We liked the notion of living in a village, rich with history, which our town is. It has been ideal for us because it has great public schools, is close to downtown and has the nostalgic neighborhood feel, with kids safely playing outside reminiscent of Mark’s and my childhoods. In every way it felt right when we moved here and continues to do so. We moved here with our two young sons and all we saw was a bright future in a friendly environment. Our new neighbors welcomed us warmly with gifts of food and made themselves available to answer questions about the local school Jordan would attend for first grade. Jordan walked to school with other kids from the block and when Merrick started school he and Jordan walked together. When it came time for middle school for the boys, the bus stop was less than a block away. Lindsay and Kendall hit the friend jackpot on our street. There were five children within a year of their ages that lived on the same side of the street as us. The kids played from yard- to -yard and house- to- house. There was no need for “play dates.” They made friends at school and on the block and their friends’ parents became the friends of Mark and me. No community is perfect, but ours has proven to be a good fit. The people here have shown themselves to be kind, creative and trustworthy. Block parties are common during the summer, and every Fourth of July our village has a fireworks display at the local high school. People come with lawn chairs or blankets and together we sit and “ooh” and “aah” at the pyrotechnics. Volunteers come around and gather monetary donations to help defray the cost of the event. When our world was upended On October 12th 2008 with the unimaginable loss of Jordan, our friends and neighbors took action. As we sat numb with grief and in shock, we appreciated that our village is also a place where news spreads quickly and people want to know how to help. It is a place where the then superintendent of the elementary schools, who I know through school board committee work came to my home and said the words few can say at such a devastating time, “I know how you feel.” She sat with me holding my hand telling me the tragic loss of her daughter in a car accident. She did all this on what would have been her daughters 35th birthday. I will always be awed by her compassion and grace. My family has been enveloped in a quilt of caring, with threads of care that have touched us so profoundly. We experienced firsthand how friends and neighbors gather together and figure out what you need when you’re in the haze of grief and can’t find words. They give without being asked. They pray for you, they hug you; they drop off brownies, books, and flowers on your porch-just in case you’re resting- but all the while wanting you to know that they’re thinking of you. We have been fed physically and spiritually. In the months after Jordan’s death, meals were dropped off at our home and an account was set up at a local restaurant that provided delivery of meals for 6 months. In the first year, cards arrived almost daily with notes of prayer inside. Cards came from Jordan’s piano teacher, many of his former teachers and the librarian at the high school, and so many from the parents of his friends. All of them expressed their condolences but also shared their special memories of Jordan, which I cherish to this day. I’ve learned a lot about friendship since Jordan died. Even as my friends experienced their own personal ordeals and worked through grief and losses they found time for my family and me. Friends like Terrie, Lori, Lisa and Michele made a pact with each other to check-in with me just to, “hear my voice,” or “lay eyes on me” if they hadn’t heard from me in more than a few days. And my friends Amy and Jeanne who call me every Saturday morning to ask without judgment or pressure if I’m attending our exercise class. If my answer is “yes” they pick me up and have provided a buffer as I try to gently reenter the world outside of grief. The neighbors and friends in my village showed the heights of compassion and loyalty on the day of Jordan’s memorial service. The memorial service was the same day as my daughters’ soccer game. The game was rescheduled because it conflicted with the time of the memorial service and so many families were attending the service that there wouldn’t have been enough girls to field either team. At the memorial service we walked in to see a church that seats over 700 people filled to capacity. That day we met the parents of some of Jordan’s friends who were there as proxy for their children. 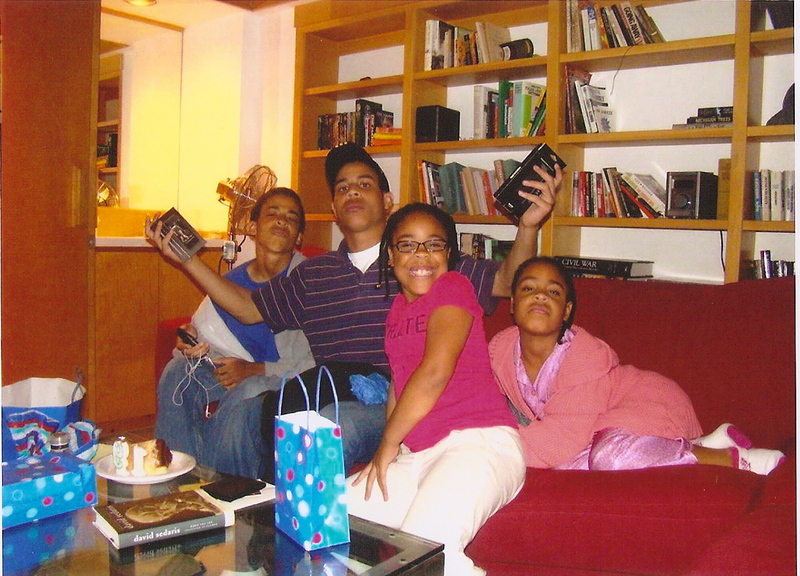 Even though they didn’t know Jordan personally their children told them how special Jordan was and is to them. My village has taught me so much about grace in action. The lessons have come through the many kindnesses of my friends and neighbors. No one ever expects to experience a devastating loss like the death of a child. On many days when grief brings me to my knees, what sees me through, is the compassion and generosity of my family, neighbors and friends. Today I offer this post as my valentine to my village. Thank you for shouldering some of our burden and finding ways to ease our pain. 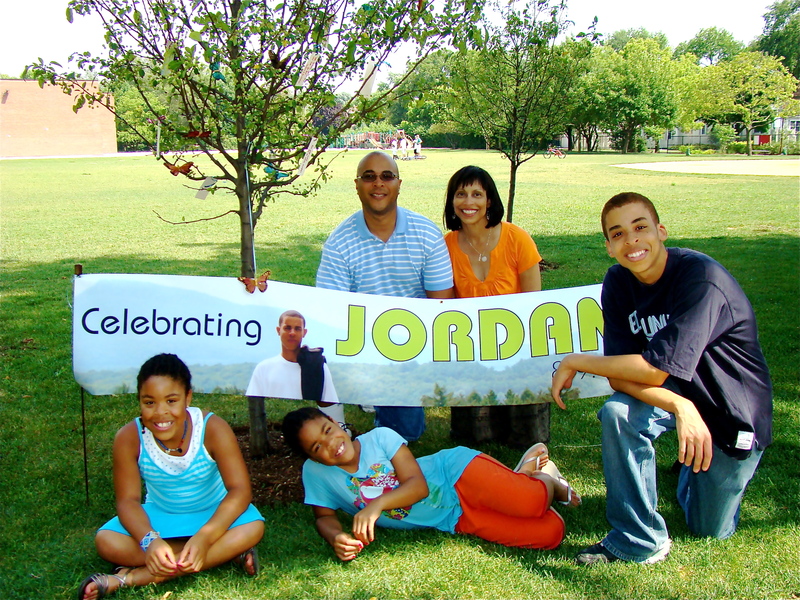 Our family at Jordan's tree dedication ceremony. The tree was dedicated by Lindsay's and Kendall's Girl Scout Troop.